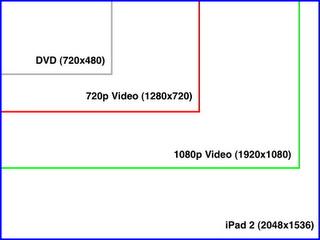 Apple can do a lot of things, but it can’t push through a new video standard. All of this iPad 2 speculation – that the new iPad will have a Retina display to show 2048×1536 content, a considerable step up from the 1024×768 of the previous iPad – is pretty much a pipe dream. Perhaps you’ll have a slightly higher resolution display this year, but forget about a Retina display. Forget about DVD (Standard Definition) video, which if displayed at native resolution would be little bigger than a postage stamp on this new display. 720p HD video (the highest resolution sold on iTunes) would fill only a quarter of the screen, and 1080p video would have black bars not only along the top and bottom, but also along the sides of the screen. Of course, Apple will scale up these videos to fill the screen, but most people don’t expect pixel-doubling when watching HD video. Essentially the only thing you can view natively on this screen without distortion or letter-boxing, then, is the output of a RED camera. While the tech exists to offer this display density, there is little proof it will ever appear in a 2011 product. I’m all for pushing the state of the art, but we all know that Apple, in general, tends to nudge it more than tip it off a cliff. As Gruber notes processing power, memory, and price difference in a Retina-display iPad would create a situation that could prohibitively price the iPad 2 out of the range of even a Macbook Air or even a small island fortress off the coast of Portugal. Dare to dream, friends, when it comes to Apple rumors, but just remember that reality is often a harsh mistress.